Flight schedule and Itinerary are subject to change without prior notice. Welcome Kit & Passports have to be picked from our Office in Srinagar .if you want us to courier them you will have to pay courier charges extra. Subject to BTQ (Basic Travel Quota) passengers only. Subject to Srinagar Jurisdiction only. 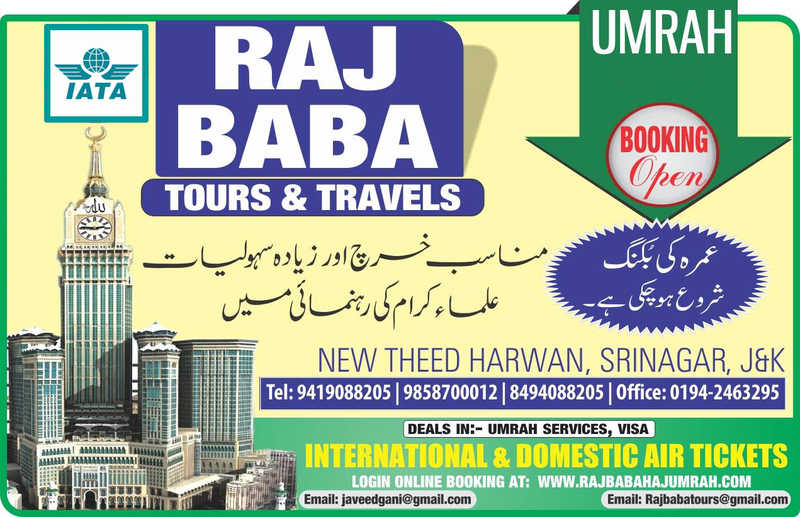 Haj/ Umrah cost does not include any personal Expenses during Travel. Tour Dates & Prices are subject to change as per Flight and Hotel availability without prior notice. Food will be served on fixed Timings, Any person coming after the specified time will have to arrange his own food. In Normal Packages Food will be served in Buffet Style and Food Parcels will be provided in Economy packages. Maximum baggage allowed per person is 20 kg Check in Baggage and 7 Kilos Hand Carry. Everyone carries his own baggage hence please travel light. Excess baggage fees to be paid by Haji. Fixed timings have to be followed strictly for Ziyarats if any person is delayed more than 15 mins he will be left out and will have to do all ziyarat at his own expenses. Please read and understand the Haj/Umrah Agreement clearly. Every Haji has to sign Haj/Umrah Agreement before departure. 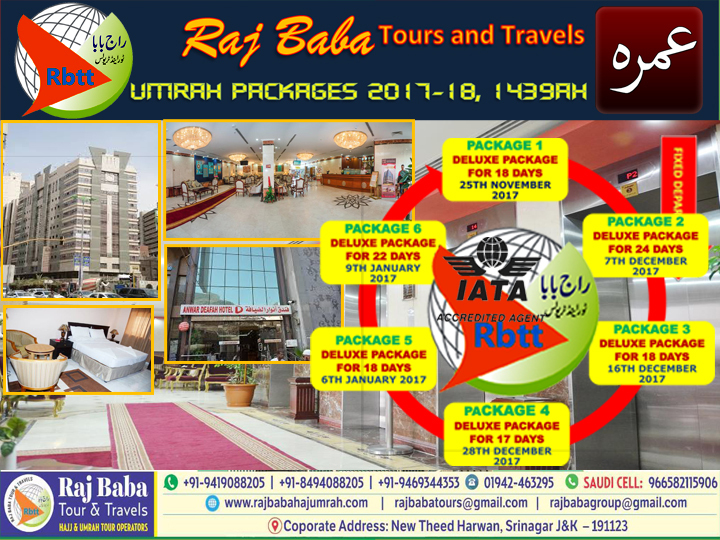 It is decision of Company\\\\\\\\\\\\\\\'s management to cancel any passengers Tour and Refund his amount ( by making deduction of air ticket cancellation charges and Visa amount) and return original passport if he is not found suitable to join the tour and is found to be a deterrent to the smooth functioning of the Tour without giving and reason or notice. Stay for 25 Days in Makkah & 10 Days in Madinah in Star Hotels. Qurbani amount is excluding and shall be charged separately.